There’s no place more magical than Elvis Presley's Graceland® at Christmas. 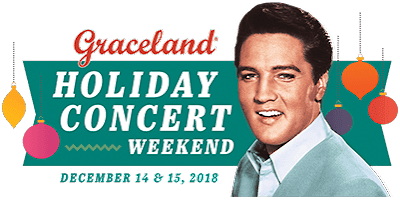 On December 14 and 15, 2018, Graceland will host a special weekend of holiday music and activities highlighted by three incredible live concerts on the Graceland Soundstage at Elvis Presley’s Memphis entertainment and exhibit complex: Christmas with Elvis with Live Orchestra; An Elvis Gospel Christmas and Elvis Live in Concert. Anyone attending these concerts will receive free admission to Elvis Presley’s Memphis at 3:00 p.m. that day where they can visit two newly expanded exhibits: ICONS: The Influence of Elvis Presley and Presley Cycles. The weekend will also include several unique holiday activities such as a “Christmas at Graceland” Archive Presentation, Christmas Tips, Tricks and Crafts seminars at The Guest House at Graceland™ hosted by Lifestyle Expert JJ Keras, who has been regularly featured on the Today Show and Good Morning America, and a special screening of the Hallmark Channel’s movie “Christmas at Graceland” in The Guest House Theater. In addition to the concerts and activities, the joy and beauty of the holiday season can be found throughout the Graceland campus. The Mansion will be decked out with a Christmas display that includes hundreds of blue lights along the driveway, a life-size Nativity scene, Santa and his sleigh, and much more, all originally displayed at Graceland by Elvis and the Presley family. Seasonal holiday tours of the interior of Graceland Mansion, featuring the Presley family’s personal Christmas décor, will be offered through January 8. This special Christmas concert debuted last year and became an instant classic with fans and families. The show features Elvis’ holiday favorites performed live on stage, with the full, rich sound of a 32-piece orchestra, featuring local Memphis musicians, vocalists, choirs and dancers including members of the Memphis Symphony Orchestra, the Tennessee Mass Choir and Havenview Middle School Choir. For the second consecutive year, the concert will be under the musical direction of, and conducted by, Robin Smith of the Royal Philharmonic Orchestra and the London Symphony Orchestra. Smith conducted the critically-acclaimed live orchestra tour of Elvis Live in Concert performances throughout the United Kingdom, continental Europe and the United States in 2016 and 2017. An Elvis Gospel Christmas – Live at Graceland Saturday, December 15 at 5:00 p.m. at the Graceland SoundstageAn inspirational and uplifting concert featuring Elvis' favorite gospel and Christmas classics performed by gospel greats the Blackwood Brothers Quartet and former members of JD Sumner and the Stamps Quartet. The original Blackwood Brothers Quartet, led by James Blackwood, sang at Gladys Presley’s funeral at the special request of Elvis and Vernon Presley. James’ younger son Billy Blackwood now continues the Blackwood Quartet legacy. JD Sumner and the Stamps Quartet were Elvis' male back-up singers from 1971 to 1977. Former members who will be performing include Donnie Sumner, Ed Hill, Larry Strickland, and Bill Baize. An unforgettable concert experience featuring Elvis live in concert and on the big screen performing the King of Rock 'n' Roll's greatest hits, backed by an all-star band featuring legendary TCB Band guitarist James Burton. Burton began working with Elvis in 1969 and was the leader of the TCB Band. A member of the Rock and Roll Hall of Fame since 2001, Burton has also been recognized by the Rockabilly Hall of Fame and the Musicians Hall of Fame and Museum. The Graceland archivists have created a brand-new presentation full of stories and artifacts spotlighting Elvis’ favorite time of the year: Christmas at Graceland. Lifestyle Expert JJ Keras will help you save time and money this holiday season as she demonstrates fabulous holiday DIY ideas using items you already have around the house. The event is free to all Holiday Concert Hotel Package Holders as well as anyone who purchases tickets to two or more holiday concerts. Saturday, December 15 at 12:00 p.m. at The Guest House at Graceland Theater. The screening is free. JJ Keras will be offering Tips and Tricks to help you create your own Very Merry Christmas. Want to host an unforgettable holiday party? Want to decorate like a pro? Want to give the perfect gift? You’ll learn how in this engaging seminar. The event is free to all Holiday Concert Hotel Package Holders as well as anyone who purchases tickets to two or more holiday concerts. Elvis Presley’s Memphis will ring in the holidays with its own beautiful décor and the expansion of two exhibits: ICONS: The Influence of Elvis Presley and Presley Cycles. The ICONS exhibit, already filled with items from many Elvis fan celebrities such as John Lennon, Bruce Springsteen, Elton John and Justin Timberlake, will add artifacts from many popular performers. Admission to the complex and exhibits will be complimentary at 3:00 p.m. on both Dec. 14 and Dec. 15 for anyone attending a concert that day. The Guest House at Graceland Holiday Concert Packages To celebrate the Holiday Concert Weekend, the AAA Four-Diamond Guest House at Graceland resort is offering a special package for the weekend and will hold a series of festive events which will be free to package holders as well as anyone who purchases tickets to two different concerts. The package includes two nights at The Guest House at Graceland in a standard guest room plus two Deluxe section tickets to all three concerts at the Graceland Soundstage on December 14 & 15. Additional information on hotel packages available here. Tickets are also available without hotel stay, including VIP ticket packages. For more information on the weekend and ticket information, visit Graceland.com/Holiday.